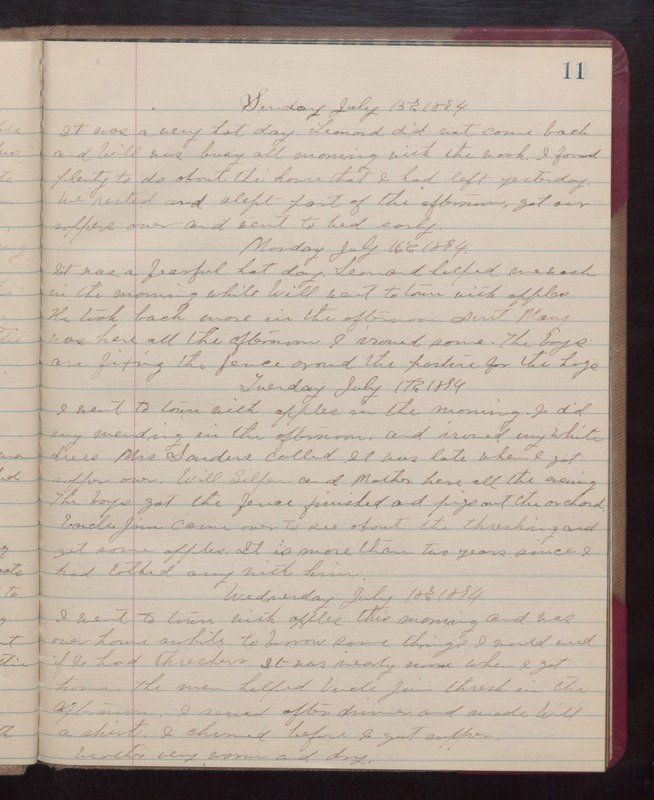 Sunday July 15th 1894 It was a very hot day. Leonard did not come back and Will was busy all morning with the work. I found plenty to do about the house that I had left yesterday. We rested and slept part of the afternoon, got our supper over and went to bed early. Monday July 16th 1894 It was fearful hot day. Leonard helped me wash in the morning while Will went to town with apples. He took back more in the afternoon. Aunt Mary was here all the afternoon. I ironed some. The boys are fixing the fence around the pasture for the hogs. Tuesday July 17th 1894 I went to town with apples in the morning. I did my mending in the afternoon and ironed my white dress. Mrs Sanders called. It was late when I got supper over. Will Silfer and Mother here all the evening The boys got the fence finished and pigs out the orchard. Uncle Jim came over to see about the threshing and got some apples. It is more than two years since I had talked any with him. Wednesday July 18th 1894 I went to town with apples this morning and was over home awhile to borrow some things I would need if I had threshers. It was nearly nine when I got home. The men helped Uncle Jim thresh in the afternoon. I sewed after dinner and made Will a shirt. I churned before I got supper. weather very warm and dry.